Welcome to Isle Smile online! Dr. Sandy Pape and her team of doctors are excited to treat patients of all ages. We strive to meet all of your family’s dental needs in one convenient location. We have a great team of dentists, who are experts in their specific fields of dentistry, ready to take excellent care of you. Our Isle Smile dental team provides comprehensive dentistry, which means that we offer both cosmetic and general dentistry. We also have specialists who come in to do complex procedures so patients do not need to be referred out of our office. Whatever your dental needs might be, chances are we can take care of all of them under one roof. The Isle Smile staff is available 24/7 for dental emergencies. Our dental office has a relaxed, island feel where our friendly, well-trained professional team can accommodate the needs of Spanish, Serbian, Polish, and English-speaking patients. We are committed to using the latest dental techniques and technology. Our dentists can create clear, 3D images that will help them plan complex dental procedures with the use of I-CAT Cone Beam 3D Imaging. In addition, we provide BOTOX®, whitening, and fillers at our office. 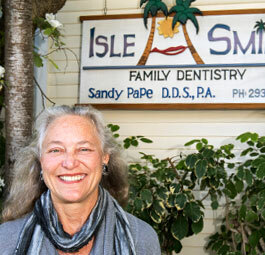 For over 20 years, Dr. Sandy Pape has joyfully provided dentistry in Key West, Florida, as well as patients in the surrounding areas of Sugarloaf Key, Summerland Key, Big Pine Key, Plantation Key, Tavernier, Key Largo, Marathon, and Islamorada, Florida. Feel free to contact our dental office to learn more and to schedule a visit, or better yet, stop by in person to say hello! Copyright 2019 © Isle Smile. All rights reserved.